Juicy Fruit may not be the gum with the longest lasting flavor but, say what you will, their yellow packaging is immediately recognizable. The same is true of the green packaging on Doublemint, it’s just as easy to pick out in the checkout line in the grocery store. This is the product of around 100 years of marketing on the part of Wrigley Gum. Thus, when Chi-Town Vapors (a company dedicated to creating flavored e-cigarette fluid) decided to make e-cigarette flavors titled “Juicy Fruit” and “Doublemint” Wrigley decided to slap them with a lawsuit that Chi-Town is going to have a heck of a time wriggling out of. Just last week, Wrigley brought a lawsuit alleging federal claims of trademark infringement, trademark dilution, and unfair competition, as well as an Illinois state law claim of deceptive trade practices, and a common law claim of unfair competition. Wrigley’s claims are strong in this case, mostly because of how Chi-Town Vapors has conducted their marketing and the nature of Chi-Town Vapor’s business. Especially strong are the claims of trademark infringement and trademark dilution. Chi-Town’s missteps are a good lesson for burgeoning businesses, especially when your product can-like Chi-Town’s-be especially vulnerable to dilution claims. In order to help keep your business’ safe, let’s take a look at this case, how it’s likely to shake out, and how trademark infringement and trademark dilution work. Wrigley is an old company. A very old company. They’ve been selling Doublemint and Juicy Fruit gum for over a century. They’ve had a number of trademarks on “Juicy Fruit” and its associated logos for ages. Some registered as long ago as 1915, others issued a mere 60 years ago in 1953. It has similar trademark and trade dress (protection on the appearance of the packaging or building design consistently used by a company) on their Doublemint gum. With all these age old registrations, you have to know it was a bad idea for Chi-Town Vapors to outright name the flavored e-cigarette liquid they sell “Juicy Fruit” and “Doublemint.” Chi-Town didn’t stop there, and their legal problems may not stop with Wrigley. They named flavors “Skittles,” “Hawaiian Punch”, “Kahlua,” “Mountain Dew,” “Red Bull,” and “Nutella.” All of these are registered marks and, no, Chi-Town didn’t get permission to use any of them. In a prime example of digging your own legal grave, Chi-Town Vapors’ marketing materials even included pictures of the products the flavors are based on or have their own name on incredibly close approximations of the packaging of products such as Doublemint gum. They must have caught wise to the fact that this wasn’t the best idea because, in January 2017, they took down these pictures and changed the names to things like “Joosy Froot;” still using the recognizable packaging of the candy as part of their marketing materials. Unfortunately for them, this is still extremely unlikely to be enough to get them off the hook. Trademark infringement mostly deals with the likelihood that the use of your registered trademark by another may confuse consumers as to the source or sponsorship of goods or services. For instance, if you have a trademark on Widget brand milk, and the guy across the street starts selling Widget brand almond milk, that would be a pretty clear-cut case of trademark infringement. This is especially true due to how close the other store is and how similar their product is. 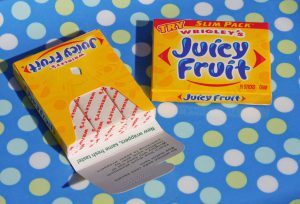 Chi-Town used the exact name and packaging of both Juicy Fruit and Doublemint on a product designed to taste as identical to each respective gum as possible. There is serious potential that a customer would look at those flavors and think they were sponsored by Wrigley-thus why Chi-Town is in so much trouble. However, as rough as the case may be for trademark infringement. Chi-Town Vapors has it worse when it comes to dilution. Dilution doesn’t need to show any confusion from consumers or even competition between the owner of the famous mark and the accused party’s product. Instead the owner simply needs to show blurring (that there is a likelihood of dilution in the consumer’s mind between the mark and their product) or tarnishment (a likelihood that association with the accused person’s use of the mark would damage the reputation of the owner’s mark). In order to receive this incredibly powerful protection, you need to be especially famous. However, with factors including how well known and how long the mark has been used as part of that analysis the 100-year-old and near universally recognizable Wrigley brands should qualify fairly easily. It is the second half of dilution-tarnishment-which is the real trouble for an e-cigarette fluid distributor. Even in Wrigley’s complaint, it’s clear that they are leaning heavily on this argument to establish their dilution case. Not surprisingly, Wrigley has something to say about the practice of selling candy-flavored cigarettes. They point to studies out of the FDA, the Senate, and more which argue that flavoring e-cigarette materials like candy “harmfully targets children under 18 years of age.” To say that selling cigarettes to children has the potential to tarnish Wrigley’s brand is an understatement. What Can You do to Avoid Chi-Town Vapor’s Sticky Situation? As bad as the situation is for Chi-Town Vapors, and it does look bad, no case is a guaranteed slam-dunk. However, the best litigation strategy a company can take is to never face litigation at all. This isn’t always possible, but you can take steps in your branding to avoid Chi-Town Vapor’s situation. First and foremost, don’t use famous brand names on your products without permission. This is obvious, but it bears repeating. If your business deals with something that might harm the reputation of a brand, liquor or tobacco for example, you have to be especially careful. This goes double when a famous brand targets children as customers. Another important step to take is to hire an attorney to do a trademark search for any logos or marketing slogans you want to use. This is generally fairly cheap and goes a long way towards avoiding a trademark infringement lawsuit. Your business is too important to risk a lawsuit or the expense of having to entirely change your branding after working to build it up-take the steps to make sure you don’t end up in Chi-Town Vapor’s situation.